Reliable Oven Cleaners SW16 Knights Hill | RDA Cleaning & Maintenance Ltd. The well-known RDA Cleaning & Maintenance Ltd. is a reputable oven cleaners Knights Hill SW16 with 10 years of experience in the field. We have all the necessary knowledge and oven cleaning tools to give your oven a nice refreshing disinfection. We clean both - from the inside and from the outside. If needed, we also dismantle the device and re-assemble it back in the end. Degreasing and de-scaling are included in the service with no extra charging. The oven cleaners are very skilful in stain removal. They eliminate oily spots, burnt stains, leftover organic dirt and residues. Attention: all oven cleaning services are strictly executed with tested natural remedies. Your family is protected - chemicals are not involved in any of the sanitizing actions we do. After hard scrubbing, we rinse the stove parts carefully to give it a double protection. If required, we will also polish the oven surfaces gently and safely. 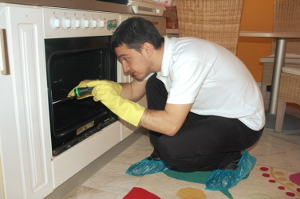 To book our deep oven cleaning service in Knights Hill SW16 or another related service, just call 020 3404 1646 or send us an online request here. The customer support is obtainable 24/7, so you will receive a written confirmation within 2 hours. We do offer same day cleaning services too. Otherwise, you can book your oven cleaning for just about any day of the year. The earlier ahead you book, the better the price will be. We demand no deposit for booking. Our fees are fixed, so there are no hidden fees. Book now it is easy and free!